Obviously, this appeals to people who are new to Twitter, but I have also identified a significant audience of people who have created accounts in the past but dropped off after a few tweets. This guide is for them, too, as it explains how to make Twitter a more rewarding experience and also gets into some of the more advanced features and conventions. If you want to learn more about Twitter In 30 Minutes or show your support, please visit the official Twitter In 30 Minutes website. I also wanted to give an update about blogging. It's been some time since I updated Digital Media Machine. On one level, that bothers me because I live and breathe digital media, and certainly have a lot to say. On the other hand, the lack of content on this blog (and my other online spaces, ranging from product blogs to YouTube) reflects the reality that I simply do not have the bandwidth to regularly contribute content to Digital Media Machine and elsewhere. What's taking up my time? In 30 Minutes guides are part of it, but the other aspect relates to my consulting activities. I work with a small number of startup clients on marketing and business administration. I started doing this about a year ago, because our family income had suffered greatly (referenced in an earlier blog post about failure) and I didn't want to take a salary from In 30 Minutes guides. Over time, the consulting has grown from about 10 hours per week to 25 or more, and I just don't have the added hours to blog regularly. The exception: Digital content associated with new releases. 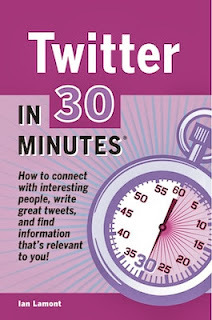 For Twitter In 30 Minutes, that includes this blog post, as well as a short series of basic Twitter videos I posted on YouTube and on the companion website. As I don't see my hours freeing up anytime soon, don't expect too many posts on Digital Media Machine. The best way to keep up with my activities is on @ilamont, and @in30minutes. It's much easier to make 140-character updates than it is to write full-fledged blog posts.